We’re not here to stoke fear, but it’s no exaggeration that the consequences can be catastrophic if asthma is not adequately monitored and proactively treated. Asthma sufferers have sensitive airways which react to a wide and varied range of emotional, physiological and environmental triggers. Once triggered, an asthma attack involves inflammation of the lining of the airways, the tightening of muscles around the airways, and the excess production of mucus. As you would imagine, this makes it hard to breathe – like trying to breathe with someone standing on your chest! It’s a threat parents struggle with constantly. Children can’t adequately convey the severity of their symptoms to parents, who then are unable to treat them or accurately explain the situation to doctors. This, in large part, is why those aged under 15 are much more likely to be hospitalised. Fear and a complete lack of awareness of the nature and severity of their child’s symptoms, may cause parents to make poor management decisions. Typically, kids are being overmedicated, or vital warning signs are being missed as current monitoring techniques are outdated and inexact. Startlingly, the rate of death caused by asthma has remained unchanged since 2003. That means despite all the advances in technology we have seen in the past 14 years, nothing has reduced asthma deaths in Australia and globally. Yet, all that is set to change. It is estimated that the global market for asthma and chronic obstructive pulmonary disease (COPD) will reach $47 billion this year (2017) with over 330 million people globally suffering from asthma alone. Clearly there’s a large and growing addressable market for a company that could revolutionise asthma monitoring products and change the way asthmatics — and their parents — monitor symptoms, take proactive precautions through better medication management, and ultimately gain peace of mind and a better quality of life. Today’s ASX listed MedTech company has developed a world leading, comprehensive monitoring and management system that measures a patient’s wheezing. The product provides real-time and continuous data to proactively manage the treatment of asthma. This includes gaining a better understanding of things that can trigger an attack such as weather and airborne allergens like pollen. Now, before we go too far, it should be noted that this company represents a speculative investment and those considering this stock for their portfolio should seek professional financial advice before making a decision. 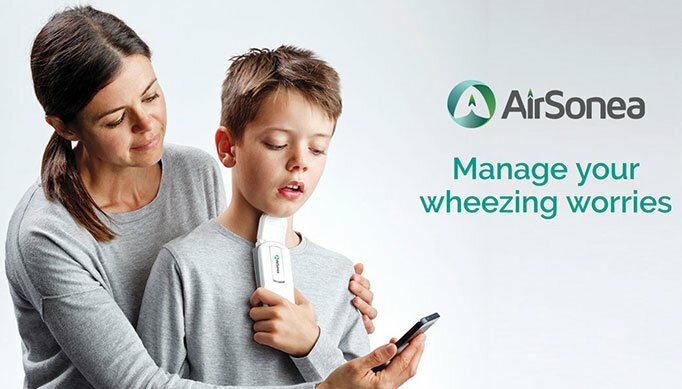 The company has already employed its technology in its consumer product known as the AirSonea® Wheeze Monitor, which will be available without prescription and over the counter. Think of this company’s product as a “digital stethoscope” – connected to your smartphone via Bluetooth. This technology has the potential to change the way asthma is monitored, managed, and treated particularly as consumers are today much better equipped to monitor their own health (think wearable tech like Fitbit). This company’s products are a natural extension of tech focused health and medical trends. And now, in a move that will bring it a huge step closer to commercialisation, the company is directing all their focus and efforts in securing partnership agreements to help prepare and launch a new generation of its continuous monitoring system in a large overseas market, providing the next major catalyst for this stock. 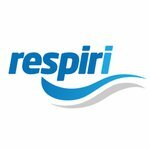 Respiri Limited (ASX: RSH) — currently valued by the market at a modest $16.4 million — is a medical technology (MedTech) company that has developed a range of devices and mobile health applications to monitor and improve the management of chronic, costly respiratory disorders including asthma and COPD. Medtech companies can often attract large valuations via M&A deals, and whilst this is early days for RSH, ultimately this is what the company might be aiming for. RSH’s range of software and technology devices has been developed using the company’s Acoustic Respiratory Monitoring (ARMTM) technology which measures the primary symptom of asthma, wheezing. They include its AirSonea® at home monitoring device, the hospital and clinical monitoring system, PulmoTrack and the at home overnight monitoring system, WholterTM. Each product has undergone thorough testing with a long history of successful, independent clinical trials at a number of the world’s leading hospitals including Royal Bromptom Hospital (London, UK), University of Edinburgh (Scotland), Charite University Hospital (Berlin, Germany), University of Chicago (US), Massachusetts General Hospital (US), California Allergy & Asthma & UCLA (US). The products have received regulatory approval (CE Mark, TGA and FDA) and have also received overwhelmingly positive responses from test users and medical practitioners. RSH’s AirSonea® sensor device and app technology is a “monitoring” product to be used by patients that have been diagnosed with asthma rather than a “diagnostic” device. This enhances the opportunities for collaboration with global industry leaders and delivers multiple revenue streams including consumer, physicians and healthcare workers, payers, telemedicine and employers. These products — the details of which we’ll get into shortly – combined with the lack of alternatives, means that RSH leads the way in new technologies to better manage asthma and allow for further and more accurate exploration of the triggers. It should be noted though that this is an early stage play and those considering this stock for their portfolio should seek professional financial advice before making an investment decision. The following video offers insight into RSH and how its products can monitor and manage this crippling condition. The triggers for asthma are wide ranging and different for each and every sufferer. An attack can be triggered by allergies (including dust mites, pollen, and moulds), exercise, certain foods or drinks, air pollution, dry cold air, stress, or colds and flus. Pollen is a major allergen in Australia and is not something to be taken lightly. The recent deaths caused by thunderstorm asthma in Melbourne made it clear just how deadly asthma can be. RSH plan on incorporating pollen counts and sending notifications on days where the count is expected to be high. The use of this ground breaking app feature will change the market, increase patients’ awareness and seek to reduce asthma incidents and hospitalisations. As you can see above, asthma is a global phenomenon that is all too often deadly across both developed and developing nations. Locally, one in every nine people in Australia has asthma. That’s more than two million people in this country alone. Incidence rates are even higher in countries with higher levels of air pollution, which is a major risk factor for asthma. Asthma is the leading cause of hospitalisation among children in China and imposes a significant burden on their families. 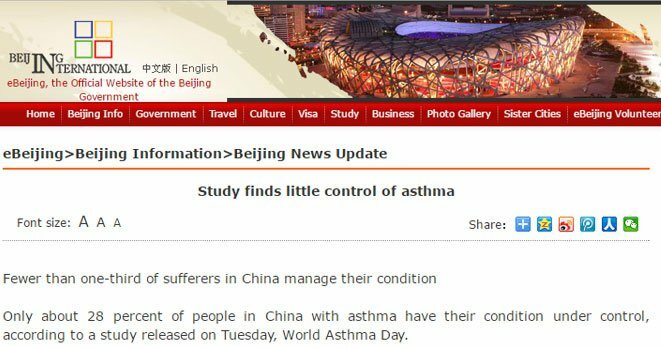 The Asia Asthma Development Board said China has the world’s highest mortality rate from asthma, with 36.7 out of 100,000 patients dying from the condition. The potentially fatal disease has risen quickly across the nation, with Shanghai recording the fastest increase in prevalence of 190% over the past decade. It’s estimated that of the more than 30 million patients in China, about 80% fail to effectively control the disease and less than five percent have received standard treatment. And its incidence is on the rise. Many parents have a reactionary approach to managing asthma. They throw Ventolin at them, hoping that it is having a benefit ahead of the curve. This leads to many children being overmedicated with steroid based medications, out of fear and without a consistent strategy. The good news is that if managed adequately, asthma deaths are largely preventable. A 2014 study in the UK by the UK Asthma Foundation attracted a lot of media attention in the UK and around the world when it found that two-thirds of asthma deaths had potentially preventable factors. This National Review of Asthma Deaths, ‘Why Asthma Kills,’ looked at 195 deaths due to Asthma. It found that overall asthma management, including primary and secondary care, was good in less than one in every five case of death with doctors and nurses failing to identify, and then act on, risk factors for asthma. The results came despite the existence of evidence-based asthma guidelines developed nearly thirty years ago that identified potentially preventable factors that are repeatedly seen in the care of patients who die from asthma. Currently there isn’t a single reliable test and no standard diagnostic criteria for asthma. Spirometry is a lung function test that is used to measure how effectively air moves in and out of the lungs and is the current method used to diagnose asthma. However — and this is a major limitation of spirometry — children younger than seven years old can’t perform these lung function tests. That leaves no reliable and accurate way to measure a child’s asthma and its symptoms, the efficacy of treatments or consistent ways to detect triggers and allergens. The ideal way to monitor and manage asthma in children is to have a system that non-invasively and objectively measures wheeze and captures the data in real-time that is recorded and stored in an electronic diary – just as RSH products can do. Monitoring and recording wheezing means the sufferer can identify flare ups when they occur, correctly use inhalers and medications, and manage the pattern of symptoms to better understand and avoid triggers. Plus it helps form a documented asthma action plan. Doctors urge all asthma sufferers to have a written asthma action plan, yet only 20% of adults have one and 41% of children under 15. Current systems of monitoring symptoms are in desperate need of a refresh. Outdated technology is still being used, but this is all set to change as digital health platforms like RSH’s replace the old technology. At home, asthma monitoring has traditionally relied on peak flow meters. But there are many limitations with these outdated devices. For one, they can’t be used by children aged under seven years. They also require a significant amount of effort from the patient and for that reason they are often not well utilised. Again, this technology is outdated, it’s not suitable for use by children, and patients aren’t using it because it requires considerable effort to measure and manually track. RSH’s new technology is ushering in a new gold standard and world leading solutions to help asthma sufferers. RSH’s technology removes the uncertainty and guesswork and allows for a more proactive approach to managing asthma. RSH’s main focus is the convenient and easy-to-use consumer product AirSonea®. It was designed to help asthma sufferers gain a better understanding of how they are affected by asthma and to help them better adhere to their treatment plans. 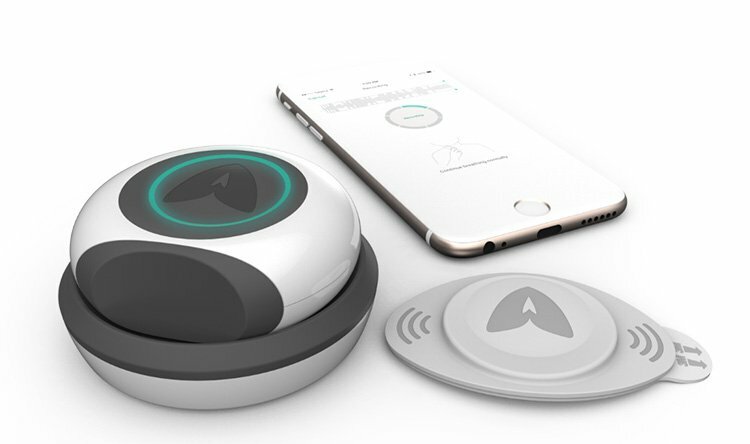 The AirSonea® home monitoring device connects to a smartphone app via Bluetooth to detect and measure wheeze. AirSonea® has a stethoscope-like monitor that utilises special contact microphones, or acoustic sensors, to pick up breath sounds from the lungs when it is held against the trachea, or the chest. It measures rate of wheezing, which is the amount of wheeze per breath cycle over a 30 second period. Because there is no standard normal amount of wheeze, AirSonea® is very beneficial in that it uses its proprietary and patented technology to measures each individual’s amount of wheezing compared to past readings. Please note this new generation is in concept only phase and the final product may be subject to change. The user will get objective information continuously and in real-time which can allow them to share their data with their Doctor. Doctors can see time and date stamped graphical data showing the correlation between asthma events, allergic triggers and medication use for any given period. 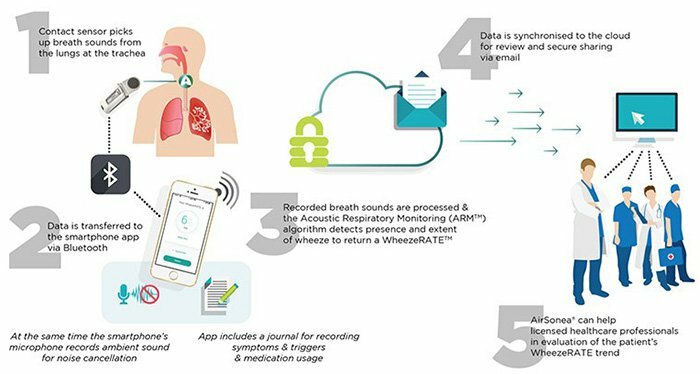 The technology also allows doctors to identify any correlation between the rate of wheeze, and the patient’s medication, and causes such as exercise, animal dander, or other allergens and then charts this information. Data is transferred to the app via Bluetooth where symptoms, triggers and medications can be recorded and shared with doctors. Major US healthcare organisations, such as Kaiser Permanente and Mayo Clinic, are already using text messaging programs to better engage patients, so RSH’s products are in line with this kind of modern engagement. In January 2017, RSH announced that it had completed its core software platform and smartphone app for use with its AirSonea® device. All RSH’s devices and applications have been developed using the company’s ARMTM technology. The ARM technology processes patient data and this is synchronised in cloud storage for future evaluation and understanding. ARM records airway sounds to detect continuous adventitious breath sounds and measure the extent of wheezing caused by airway obstruction. The measurement is presented as WheezeRATETM. This unique proprietary algorithm technology means RSH has a first mover advantage. This core technology also provides the basis for the development of its state of the art wireless overnight monitoring device, WholterTM. The overnight at home monitoring system will provide 8-24 hour recording of nocturnal wheeze and coughing which is valuable information to take to doctors as asthma symptoms are often worse at night. Over 70% of all fatalities from asthma are a result of catastrophic nocturnal asthma event. This option of monitoring asthma patients and collecting data for a period of time in the patient’s own home is important for both doctor in their design of treatment plans and patient, particularly parents of children with asthma. RSH is currently exploring an upgrade to wireless capability and app function. Another of RSH’s products is the SonoSentryTM standalone device. This is the first over-the-counter wheeze detection device cleared by the FDA. It has on board computation and can be connected to PC via USB, or data can be uploaded to cloud via web portal. In addition to RSH’s at home monitoring systems, the company’s PulmoTrackTM was designed for hospital and clinical based real-time monitoring of wheeze and cough. The system continuously tracks and records breathing sounds and the detection of wheezing. It is especially valuable in the management of acute, severe asthma in the ER and ICU, and for Pediatric Pulmonary Function Testing and Sleep Labs. Its computerised wheeze detection is very useful for use with infants, as it is objective and can be more readily standardised than subjective monitoring, providing quantitative and non-invasive information about the extent of wheezing. RSH has secured 44 patents for its products, and its technology been cleared for use by the Australian TGA. It has also achieved the European Union CE-mark and its products are pending approval by the US Food and Drug Administration (FDA). Extensive market research returned overwhelmingly positive responses. RSH has conducted extensive market research in Australia and the US on a customer base that included patients and parents, medical professionals, insurers, pharmacies. Between 60% and 95% of all users in testing indicated that they intended to purchase the AirSonea device. A total of 100 Australian doctors, of which half were paediatricians who regularly treat asthma, were interviewed. It found that 80% of GPs and 62% of paediatricians would recommend the mobile wheeze monitoring system to their asthma patients. They overwhelmingly viewed the AirSonea device and system as an important solution to at home asthma management. In addition to consumer research, RSH also conducted qualitative in-depth interviews with key asthma experts. Leading UK physicians and scientists in world-class UK hospitals have deployed RSH’s algorithm technology to detect and measure wheeze. Dr Mark L Levy, the clinical lead on NRAD has, together with other prominent physicians, published research using RSH’s digital wheeze technology. RSH has a long history of successful, independent clinical trials at a number of the world’s leading hospitals including Royal Brompton Hospital (London, UK), University of Edinburgh (Scotland), Charite University Hospital (Berlin, Germany), University of Chicago (US), Massachusetts General Hospital (US, California Allergy & Asthma & UCLA (US). There have also been studies published on RSH’s core ARMTM technology by world-leading physicians, with the technology appearing in 14 clinical publications. Highly attractive secondary markets for RSH’s technology. Most notably, RSH’s devices and technology offer significant potential for sufferers of other respiratory illnesses too. A big one is the lung disease, emphysema, which is a chronic obstructive pulmonary disease caused by damage to lung tissue. With the developed world’s populations ageing, there is only going to be growing demand in secondary markets such as this for RSH. Whilst looking at RSH, it’s also worth checking out what else is happening in the space, amongst RSH’s peers. Another MedTech company adapting innovative technology to monitor health, is iHealth Lab. The California-based company has developed a portable Bluetooth-enabled blood glucose monitor that allows people to take a reading and have the results sync automatically to their iOS or Android device. This has many similarities to RSH’s portable asthma device. And with the number of cases of asthma in society being similar to the occurrence of diabetes, we might surmise that RSH’s technology will also be adopted by users with similar enthusiasm. But while RSH’s device is the only one of its kind, there are multiple wireless blood glucose monitors out there competing with one another. However any uptake and market penetration for RSH is speculative at this stage and therefore investors should consider all public information before making an investment decision and seek professional financial advice. Another example of not only technological success, but also financial success, comes from Dexcom, Inc. (NASDAQ: DXCM) — a US$6.55 billion MedTech company with a blood glucose measuring device. As you can tell from its market cap, the company has been very successful, and able to garner plenty of investor attention. Dexcom designed a blood glucose monitoring device to give diabetics a way to monitor their blood glucose levels. Like RSH, Dexcom’s product is not a diagnostic tool or a treatment method, but rather a monitoring device. There is no doubt that with the right MedTech product, shareholders in emerging companies can see significant growth. With RSH’s technology platform completed, the next phase for the company will likely be the announcement of commercial partners. The company is in active and meaningful discussions with potential partners who will be engaged to update and distribute RSH’s suite of next generation products. The securing of the right partnerships will allow the company to expedite the launch of its world leading monitoring and management system into its initial target markets. RSH expects to announce a partnership agreement during the 2017 calendar year. RSH’s AirSonea, Pulmotrack and Wholter technology is clinically tested, proven and approved and appears to be unlike anything else in the market. Considering that it was developed in 2012, the technology is now being enhanced. The company will launch a new generation of AirSonea prior to taking it to the market. A partner will be integral in this process to work with RSH in preparing the next generation and launching it. From there the initial product rollout will take place. This will more than likely occur in the UK initially as the country’s health providers are better integrated with one another through the National Health Service (NHS), making a launch and rollout to patients easier than would be the case in the Australian or the US markets. Following the UK, China and India are the next attractive markets. 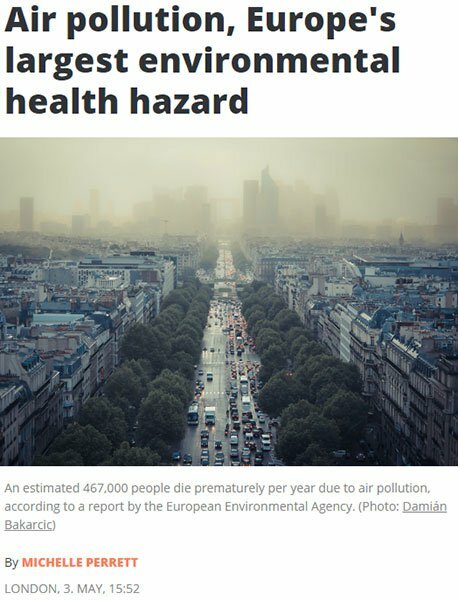 This is due to the air pollution in those countries and the growing awareness and concern around the negative health impacts than having amiable health systems. RSH is also in active and meaningful discussions with potential partners in these regions. Given the vast market potential, the limited and outdated current solutions, and the positive responses that RSH is already generating, RSH is early stage but expertly placed for success. 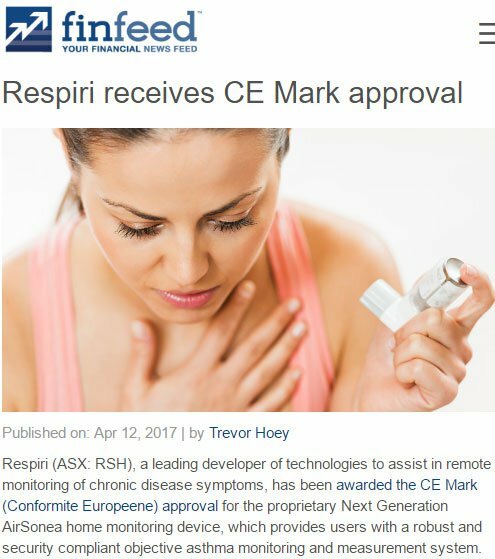 There is a clear gap in the market for comprehensive and connected monitoring systems and RSH it taking all the right steps to reassure asthma sufferers, parents — and it shareholders – along the way. Is RSH about to Strike a Major Chinese Partnership Deal for its Asthma Tech?